I had a fun studio shoot with Kim again. 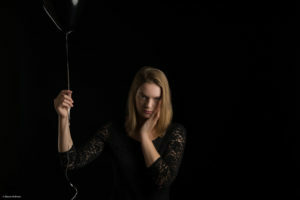 This time we had a theme about balloons and emotions. Sad and happy emotions to be precise. 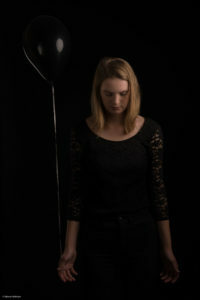 For the sad images we created a dark and black mood by using black balloons, a black outfit and a black background. We were also sparingly on the amount of used light. 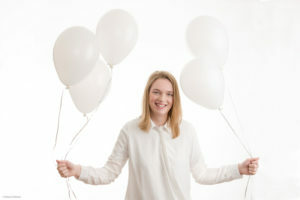 For the happy images we used exuberant bright lighting, a white outfit, white balloon and a white background. 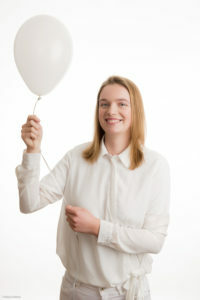 We had some fun in finding a creative solution for making the balloons fly without helium too. And of course we found a cool solution. I think these images came out pretty well. So now a big compliment and thank you to Kim is in place because it is not easy to model in these kind of emotions. Thank you Kim. You did a great job. We also did something with a gigantic golden balloon but more about that in another news post on this website.